It’s no secret that Chicago is in a pension crisis and deeply in debt. Most of that debt comes from the city’s pensions, but health insurance and long-term debt are also a significant part of Chicago’s fiscal shortfall. In total, Chicago residents are officially on the hook for $63.2 billion in government pensions, health insurance and other debt. That’s more than $23,000 per Chicago resident, or more than $61,000 per household. The unfunded pension liabilities for which the city of Chicago and its sister governments (Chicago Public Schools, the Chicago Transit Authority and the Chicago Park District) are liable equals $29 billion of the total debt. 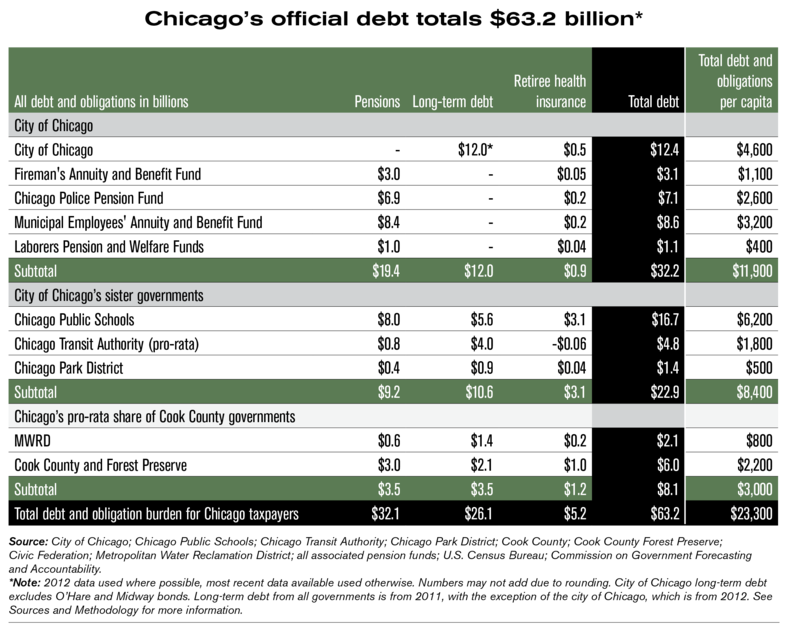 When you include the city’s share of Cook County’s debt, Chicago’s total pension debt increases to $32 billion. Chicago’s pensions are among the worst funded in the nation. Morningstar Inc. recently reported that Chicago had the worst funding ratio and the highest per capita pension liabilities among the nation’s largest 25 cities. All that debt has led Moody’s Investors Service to downgrade Chicago’s debt to just three notches above junk status. Chicago’s bonds are now rated the lowest of the nation’s biggest cities, other than Detroit. If real pension and spending reform are not enacted, higher taxes will be the only way for the city to stave off insolvency – for a while. In the end, higher taxes will only hasten out-migration from the city – nearly 800,000 Chicagoans have already left since 1992 – accelerating the city’s downward financial spiral. Unfortunately, Mayor Rahm Emanuel’s “fix” for Chicago calls for an increase in property taxes – $750 million over five years – to pay for increased pension contributions. But his plan does nothing to actually reform how the city grants retirements for city workers. And it would just be the start of a string of tax increases to help prop up the city’s other pension funds. The mayor’s tax-hike proposal is part of the false choice he’s offering Chicagoans – either pay more taxes or watch Chicago drown in debt. But Chicago has a real alternative. The Illinois Policy Institute has developed a comprehensive reform plan that doesn’t rely on more taxes to solve the city’s pension crisis. The proposal immediately cuts the city’s pension debt in half, helps protect city services from indiscriminate cuts and gives city workers control of their own retirement plan while protecting their already-earned benefits. Emanuel has called for a “sustainable and consistent” solution – the Institute’s plan is just that.